HERE THERE BE SPOILERS. YE HAVE BEEN WARNED. 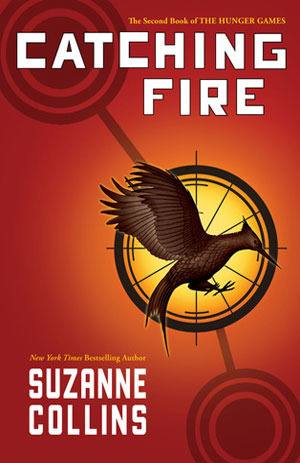 As much as I loved the first book in the series, I loved Catching Fire even more. In this second installment in the Hunger Games Trilogy, we get to see the depth of pain that Katniss and her friends experience under the Panem government’s tyrannical thumb. We get to see Katniss and Peeta living in the Victor’s Village near Haymitch and the state of their district and families. We see the tightening of the leash from President Snow. I’m not a big fan of spoilers and giving too much away from the plot of books, so I thought I’d just share my general feelings on the story. I truly, truly fell in love with Peeta’s character in this book. I liked him so much in the first book, but he really made me love him in this one! The lengths that he goes to to protect Katniss could make any girl swoon! As well, the plot was a bit more complex in this story and provided more avenues to showcase the duplicity of the government and the boiling tension of the people in the districts. It ended, of course, on somewhat of a cliff-hanger and I was dying to read the next one as soon as possible. I’m a bit into the third book now! Happy Reading! Find Catching Fire on Amazon.